A confession. I haven't seen the first movie. Apparently this is pretty much the same film in a different setting so I didn't think I'd let that stop be reviewing it. Two days before a wedding a group of friends share a drink on a beach in Thailand. One of the characters appears to have some kind mild psychosis and another is the sixteen year old brother of the bridegrooms betrothed. Having not seen the first film the slightly deranged Alan comes off as a really rather unwell Withnail with money. The following morning three of them wake up in a run down apartment in Bangkok, including the groom, with wait for it, terrible hangovers. And, you've guessed it, the clean cut sixteen year old is missing and they can't remember a thing. The thing is there are laugh out loud moments, most of them provided by a monkey, but too often the gags are either coming a mile off, in one case quite literally, or they're falling really flat. Shocking things happen to these people over the course of the movie but they're just brushed aside in order to keep things moving along nicely. It all feels a bit by numbers to be honest. A movie that should be a lot of fun falls down by trying too hard to shock. There's a moment really early on where Bradley Cooper's character drops a c-bomb in a cafe. It's kind of funny until you realise that he has his baby sat next to him. And that's just the beginning of the disproportionate shock tactics. You start to feel like the cast are unconvinced too, they really don't look like they're enjoying themselves throughout, just going through the motions. I didn't completely hate it, the end titles are probably the funniest thing in the entire film, which is kind of interesting, because they're just a series of stills. 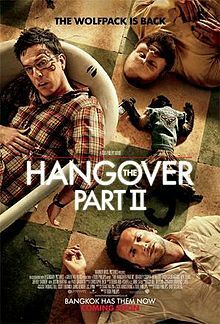 So the Hangover Part II will make you laugh but for the most part that that will be at a smoking monkey.